Persons with physical and neurodevelopmental disabilities had an opportunity to show their talents before an audience of about 800 in Marikina Convention Center last 12 March 2017 in Marikina City. The participating schools and centers prepared an exhibit showcasing their activities and artworks done by their students. This was opened at 2:00 pm prior to the program. It all started when Marikina Mayor Marcy Teodoro was invited to a program in December 2016 by Laro, Lapis, Libro Inc. (LLLI), an educational center for children with special needs, where their students performed songs and dances. Mayor Teodoro was impressed and instructed Mr. Alex Cabason, Jr., former President of ASP Marikina, to organize a similar program involving more schools. A committee was organized with representatives from ASP Marikina, Persons with Disability Affairs Office (PDAO), Marikina General Service Division, Eucharistiana Center, LLLI and SPED Centers. Teacher Tina Aligada, Executive Director of LLLI, was appointed head of the committee. The mayor’s office generously provided the venue for free, and food for the performers and organizers during the program. The program itself, entitled “MAHUSAY” (MArikina, HUmahanga kami SA’Yo) started at 4:30 PM, with Mayor Marcy Teodoro as the keynote speaker. He expressed his admiration for the performers, his wish that their talents be developed further and his support for programs for PWDs. The almost 200 performers came from public elementary school SPED Centers in Barangka, San Roque, Concepcion and Parang, LLLI, Eucharistiana Center, San Lorenzo Ruiz Academy, Marikina Persons with Disabilities Federation, Inc, and ASP Marikina. The program, lasting 2 hours, included individual and group songs and dances, band performances, a Taekwondo demonstration, and the reading of an essay prepared by a person with autism. ASP Marikina’s contributions were the Taekwondo performance by RG and MM Guinolbay, two songs by the Tiamzon Family band, (mother Ditas on the guitar, and siblings Ron as vocalist , and Jeboy on the keyboards), the essay on “Play as a form of Research” by Anjulie Reyes, and a drum solo by Maurice Allen Reyes. It was a totally exciting and fulfilling experience for the PWDs who performed that afternoon, as well as the teachers who taught them, and the organizers who planned the details. Most of all, Mayor Teodoro was proud that such a program has been accomplished in Marikina. 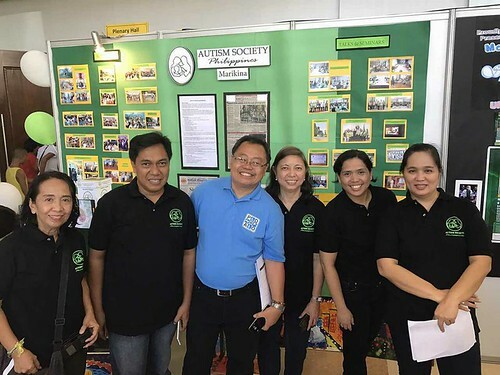 About the contributor: Marivi Cabason is one of the Founding Member and now serves as President of Autism Society Philippines - Marikina Valley Chapter. A servant leader and church worker is happily married to Alex Cabason, with four children. His youngest child, Victor Lorenzo or Vinz, is on the spectrum.